Trash Bin advertising consists of 4-color process silk-screened posters affixed to the front, back and sides of oura solar trash bin. Located at bus stops, pedestrians thoroughfares within urban areas often at high traffic intersections. 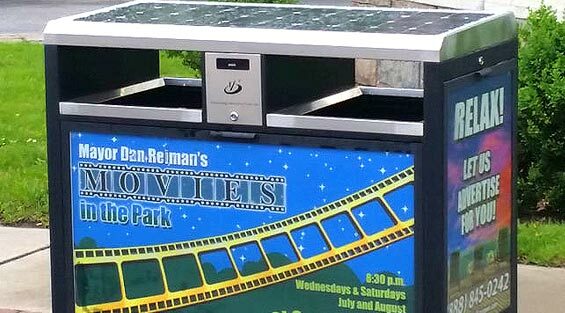 Displays are affixed to permanent trash bin structures. Primary Uses: Used to reach pedestrians and vehicular traffic in densely populated center city or campus areas. 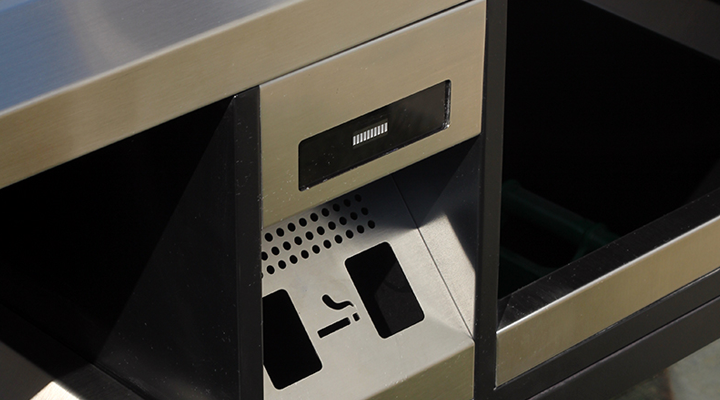 Street Smart Outdoor is now offering solar powered LED trash bins. Please contact us for more information about getting our state of the art technology and help create more US jobs for your local community. Contributes to public safety: Creates ambient lighting that illuminates surrounding area at night to make pedestrians and drivers safer. Lithography, screen printing, or digitally produced on translucent material. Copy bleeds four sides. 0.015 Styrene. For lithography, print both sides. Weatherproof/waterproof out of home inks.